1. Place the chicken, rosemary, garlic and half the olive oil in a bowl, and toss together to coat. is browned and cooked through, the juices run clear and there is no pink meat. 3. Meanwhile, place the butternut squash in a pan, cover with boiling water and simmer for 6-7 minutes until tender. Drain well, then add to the pan with the chicken for the last 5 minutes of cooking. 4. Place the watercress in a large bowl and mix in the red onion. 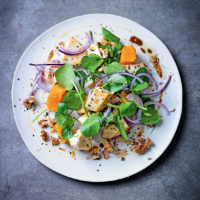 Spoon the chicken and butternut squash on top, scatter over the walnuts and drizzle with the remaining oil and balsamic vinegar. Toss together gently, then serve.